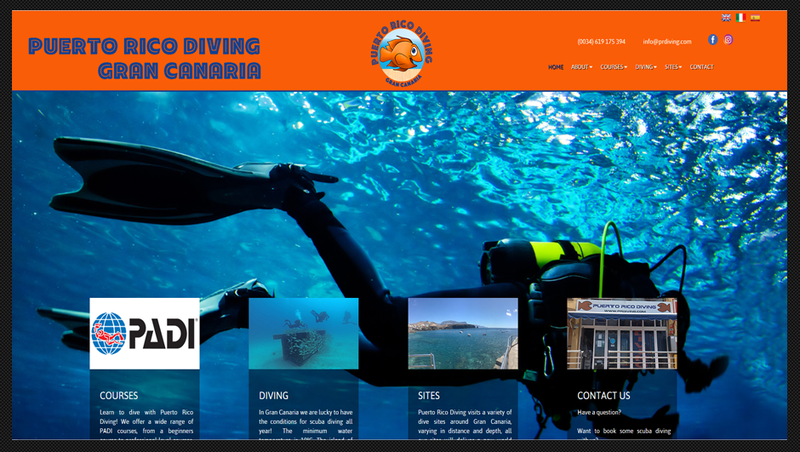 G6 Designs again went international with our work, this time all the way over to Gran Canaria, we were contacted by a Scuba Diving centre in Gran Canaria as they had recently had a website built and spent quite an amount of money on the website. Unfortunately they were not happy with the website they had built by another company as things didn't work on the website the design was all out of proportion and did not get what they were promised. So we had a chat with the owners of the Scuba Diving company and assured them that this would not be the case if G6 Designs landed the job of building their website. So they had a few meetings with other people as well as they wanted to be sure this time would be the last time they were paying for a website. After a week or so we were contacted again to say they choose G6 Designs to complete this job. So we went straight to work with the only instruction being the wanted orange to be the main colour of the website, as we do with all our customers we uploaded our work to a tester server so they can see the progress as we work, we had several calls to make minor edits and eventually got the website to exactly how they had envisioned it. This website contains a lot of software also, such as photo galleries, a blog system and contact forms. PR Diving also took out a customer care package as they knew later down the line they would want new pages adding when they get new dive sites and so on. So they took out our top package so we make any edits they require to the website and also make sure their website is performing well in leading search engines. This website is soon going to get a booking system where customers can book their diving lessons online and pay for them as well as log in to their classroom to complete tests that are needed to go diving. PR Diving expressed they couldnt believe just how approachable we were as well as loving the fact they could get in touch with us late in the evening as some days they were out diving all day. They were incredibly happy with their website and they are delighted with the results they are getting from the website.